Organizations now consider packaging as a critical issue. Effective and efficient packaging can improve the performance of companies and minimise their costs. Packaging Logistics examines all essential roles within an organization, from the purchasing of raw materials to the production and sale of finished products, as well as transport and distribution. It is important for practitioners and academics to understand the role of packaging along the supply chain and the different implications of an efficient product packaging system for successful management of operations. 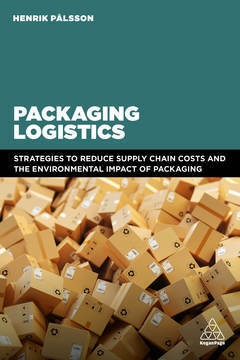 In Packaging Logistics, Henrik Pålsson covers essential hot topics such as sustainability, innovation, returns, e-commerce, end-of-life and future trends and challenges. This practical book takes the reader through every stage of packaging and relates it to supply chain and logistics, illustrated by over 30 case studies. Henrik Pålsson is Associate Professor at Lund University, Sweden. He has conducted research and taught master's students within packaging logistics since 2004. Lund University specialises in this topic and is world renowned for its research in this area.